The Missouri Mom: Extended Stay America is hosting a Recipe Contest. 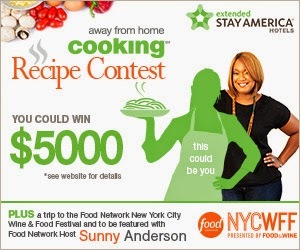 Extended Stay America is hosting a Recipe Contest. The hardest part of vacation is "where do we eat" - well the perk of Extended Stay America is they have KITCHENS in them. In fact Extended Stay America is the larges hotel chain with kitchens in every room! Currently ESA is hosting a recipe contest for fans and followers! From food lovers and moms to business travelers and road-trippers, Extended Stay America encourages aspiring cooks to submit their travel-friendly recipes along with a photo of their signature dish by visiting Contest.AwayFromHomeCooking.com. On July 28, followers will have the opportunity to select two favorites by voting for their favorite cooks on Contest.AwayFromHomeCooking.com. So visit often and check out who is your favorite! The two cooks with the most fan votes will become automatic finalists, to gain votes and support fan favorites, followers are encouraged to share the Away From Home Cooking Recipe Contest on Facebook and Twitter using #cookwithESA. Good Luck Friends and may the BEST cook WIN!